South Tyrol, a region in the heart of the Alps about half the size of Connecticut, brings into sharp focus an important part of twentieth-century history. Tyrol, a province that had been part of Austria for over 500 years and was almost totally German-speaking, was split in two after World War I and the southern part awarded to Italy as ""spoils of war. ""The first phase to follow after the split of Tyrol was systematic subjection by the Italian Fascists of what had been a regional majority in South Tyrol, but was now a minority within Italy. In a second phase, to gain an Italian majority, the country was settled with Italians from the south, who had a totally different mentality from the Italians residing in South Tyrol. With the emergence of National Socialism in Germany, and eventually with the Hitler-Mussolini Agreement of 1939, a third phase emerged: an experiment in ""ethnic cleansing"" called the ""Option."" Eighty-six percent of all South Tyroleans agreed to leave South Tyrol and become citizens of ""Greater Germany."" After World War II, the region was not returned to Austria: South Tyrol became the first victim of the Cold War. It took almost forty years of hard bargaining before South Tyrol was granted real autonomy in 1969. 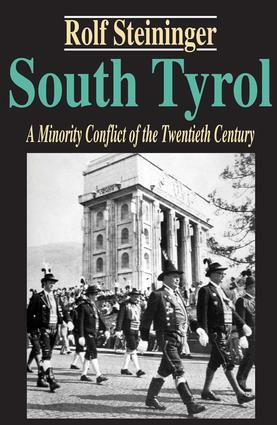 This resolution is now regarded as a model for solving minority conflicts.Rolf Steininger traces the history of this troubled region during several periods: 1918-1922, in which he covers the period from the division of Tyrol to the march on Bozen; 1922-1938, in which he reviews fascist policy towards South Tyrol; the ""Option"" of 1939; the resettlement and so-called reunification from 1943-1945; South Tyrol's role as a bargaining chip in the Cold War, and the Gruber-Gasperi Agreement of 1946; and the volume closes with a discussion of the plan negotiated in 1969 for a new autonomy for South Tyrol that came to be known as the ""Package. "".